Acorn offers a full office interior design service including up to date AutoCAD, 2D space plans, 3D walkthrough, 3D renders and sample boards. Space planning is an important part of the design process. We will ensure you are getting the best possible use out of the space you have available. It’s not only about space but workflow too. If you want to encourage a group of people to communicate but provide privacy for others this can be achieved by good design and initial space planning. We will take the time to find out how your business works or how you would like it to work. These factors are then included into the design. Our full 3D walkthroughs and rendering allow us to create a visual representation of what your space could look like. As part of our 3D design, we offer a live in-meeting service which allows us to change the finishes and make small amendments to the drawing while you sit in front of us enabling you to choose the final materials and colours. Of course design has to not only look good and work, but also follow any building control regulations, planning legislation, CDM regulations or Disability Discrimination Act compliance. Our experienced staff will always offer guidance and advice on these to ensure your finished scheme conforms. Over 20 years Acorn Works has built up a large body of work. Browse our portfolio. Bespoke specifications and proposals will be supported by AutoCAD drawings or 3-D walkthrough graphics. Office Refurbishment – Diss, Norfolk. 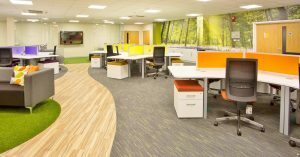 This was the initial phase of a two-year rolling complete office refurbishment programme of investment in Midwich’s Diss headquarters.